In 1749, the Exeter Theatre was opened in Waterbeer Street behind the Guildhall, roughly on the present day site of the 'Looking Forward' bronze, and the old police station in the Guildhall Centre. This theatre, presented productions between October and April each year, seldom repeating a play, and giving a huge variety of entertainment for the local population. Robert Trewman, proprietor of Trewman's Exeter Flying Post had a share in the Exeter Theatre, as well as Andrew Brice who ran the the Old Exeter Journal. A Newton St Cyres born Exeter physician and poet, Hugh Downman contracted a chronic complaint forcing him to early retirement, and to amuse himself with his own literary efforts. His second play, 'Belisarius' was performed at the Exeter Theatre in 1779, but did not do well, but in 1781, his third play 'Editha' performed for seventeen nights. He became a prolific poet and he established a literary society in the city. "... Comedian, Formerly of Drury Lane, But late of the Exeter Theatre; Who exchanged time for eternity. ..."
The first manager was a Mr Kennedy who may have also run theatres in Plymouth and Portsmouth. Later Mr Foote, who was a local butcher purchased a part share in the theatre from a Mrs Pitt. He then bought out the other share in the theatre from Mr Jefferson.The last manager at the theatre was Richard Hughes, who was a wealthy gentleman and who went on to build the New Theatre in Bedford Street. At this time, Waterbeer Street was named Theatre Lane. 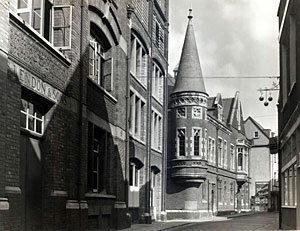 The police station with the corner tower was the site of the Exeter Theatre.